Reach towards it and the sleek, dark glass front of the operation panel slides upwards to reveal a control panel, providing easy-to-navigate wheels and buttons that give you perfect control. Load a CD, listen to FM radio or record music directly onto SD memory cards. The quality of the sound is remarkable: in fact, to the human ear, it’s indistinguishable from a CD. In addition, the technology means you can listen to files from your computer or transfer music to a BeoSound 2 or our portable BeoSound 3 player. 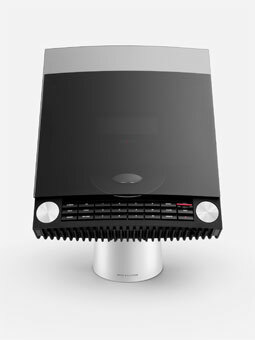 Team it with BeoPort for internet streaming, and the BeoLab 4 loudspeakers that were designed to match it for a complete, compact listening experience.